Party under the sea! 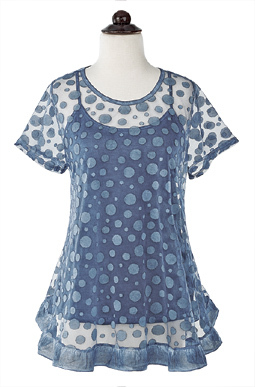 Playful blue bubbles float on this top, as fun as a mermaid carnival. Swingy burn-out voile top floats and waves, with a lightly-ruffled band on bottom. Comes with its own cami, oil-dyed for variegated color, and a bonus fringed scarf, 60" x 13" (not shown). Top approx. 26" long. Individually hand-dyed, will vary slightly. Imported. Polyester/rayon; hand wash. Sizes XS-XL.